“Mapping Hannibal” represents a new type of digital visualization for the Mapping Ancient Texts project (MAT). MAT student-researcher Daniel Olivieri (Kenyon ‘19) won a 2018 Kenyon Summer Digital Scholarship award to develop the project. 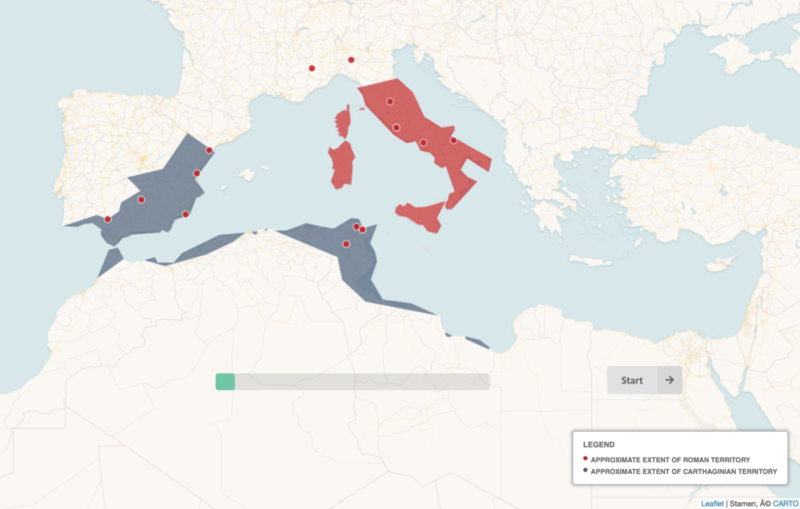 “Mapping Hannibal” is a geo-referenced digital visualization about the major events in the life of Hannibal Barca, with a particular focus on the Second Punic War. The final product maps Hannibal’s movements during his lifetime, following him from his childhood in Carthage to his years of leadership in Spain, through his momentous victories in Italy, and finishing with his defeat at the battle of Zama and eventual exile from Carthage. Visualizing this sort of geo-referenced narrative presented new and exciting challenges for MAT. After researching Hannibal and the Second Punic War, Daniel used Leaflet to create info-boxes that are geo-referenced on a Carto map layer. The info-boxes contain a summary of the relevant events that occurred in a given location (e.g., a battle), as well as links to primary and secondary sources. Presented with the challenge of narrating a long and complex story succinctly, Daniel added a glossary that allows readers to learn more about different historical figures and events without leaving the website. The resulting glossary, made using modal boxes, features over twenty entries covering important individuals, groups, and major battles. The latter are visualized with GIFs created by Daniel that animate reconstructions of the conflicts. Daniel used the Semantic UI library to establish an attractive and consistent style throughout the site. He used JSON objects to hold the data for each point and for each entry in the glossary. In order to show the approximate extent of Roman and Carthaginian territory, he used Carto’s polygon feature. Through a progress bar at the bottom of the map, the site gives users a sense of how far along they are in the narrative. In its completed form, “Mapping Hannibal” makes a famous event in Roman history available in a novel way through a digital medium. “Mapping Hannibal” emphasizes space and place; incorporates maps as well as other types of visualization, especially GIFs; and relates the narrative in a manner that is approachable, but that also provides links to primary sources, such as Polybius and Livy, and fundamental secondary sources, like the Oxford Classical Dictionary. We hope that Mapping Hannibal will be of interest to students and enthusiasts at all levels as well as to others working on digital mapping and data visualization.